The orchard was established many, many years ago and expanded upon with new heirloom varieties around the year 2000. It was established and maintained as Southern Maine’s organic apple orchard. It later fell to neglect and was left organically wild. The uniqueness in the varieties helped save the orchard from widespread disease during this time. In 2015, the orchard has begun a revitalization project beginning with care and attention to pruning, feeding and pest management using only organic materials. 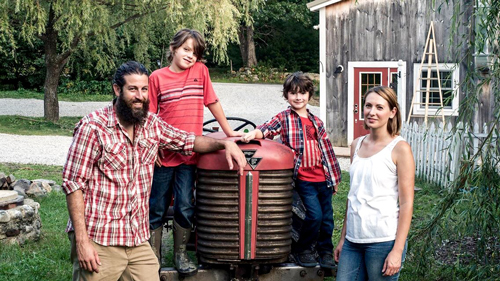 Our family lives and works on the orchard, we only want what’s best for our family and yours! Join us in the revitalization! At Eden Acres Family Farm, we grow wholesome, nutritious, delicious apples free from chemicals and full of flavor. They are sweet, crunchy and packed with what our bodies need and crave. If an apple a day keeps the doctor away, doctors beware! Since the introduction of chemical fertilizers and pesticides, the food we eat and the soil it grows in has become barren of essential nutrients. Those essential nutrients give the food its great flavor and gives us the proper nutrition for good health. Our food today has turned us into a supplement dependent society. I began growing organic food for my growing family. As they grew, so did my garden. I have used that passion for growing vital, holistic food in my approach towards growing apples. Our chemical free apples go beyond organic, with the utmost care and attention to the biodiversity of the soil and a properly balanced ecosystem. I take a holistic approach in caring for the trees as a steward of an already perfect wild symbiotic environment. Mowing is not done purposefully to encourage biodiversity. The “weeds” fix nitrogen in the soil and provide habitat and blossoms all summer to feed the bumble bees that pollinate our trees. While organic standards allow for the dousing of chemicals that destroy the microbiology of the soil and cause poor nutrient uptake, my holistic approach works to fortify the microbiology with compost teas. Microbes and beneficial fungal strands are what provide the essential nutrients and make them available for absorption for the trees and its fruit. I feed the trees with foliar nutrients to help keep the tree primed against pest and fungal attacks. We free range guinea hens and use precisely timed nematodes to knock down tick and apple pest populations. Using beneficial, living organisms is at the heart of my approach in creating a healthy system for healthy trees to thrive and produce healthy apples. Thank you for supporting local, organic food! Searching for a quality of life that would bring our family closer to nature, in the Fall of 2014 we sold our home in New Jersey and bought a small tow-behind camper. Bryan grew up in Maine and so we pointed our compass North in search of a new place to live. Of primary importance was a school for our two boys. We wanted an education that allowed them to be kids longer and place more importance on the quality of their learning, rather than test outcomes. We searched a great part of the State looking for that magic combination where we all felt a fit. 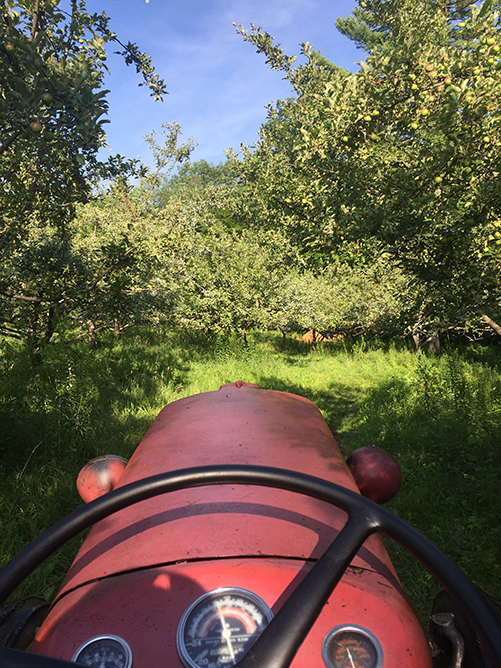 While visiting a school, within the first few minutes, we were asked if we wanted to live on a 26 acre organic apple orchard with an old farmhouse… Something clicked and we knew we had to look at it! The Orchard personified every reason we wanted to move to Maine. Armed with a passion for organic gardening and not much else, we took on the responsibility of caring for the 700+ apple trees. Our initial concern is the health and viability of the orchard. Moving forward, we look to diversify our offerings to include apple cider, apple desserts, apple cider vinegar and other apple based products.